Fountains of Wayne is an American power pop band, formed in 1995. The band name was taken from the name of a lawn-ornament store in Wayne, New Jersey, not far from Montclair, New Jersey, the hometown of the band's bassist and cofounder Adam Schlesinger (it has since gone out of business). According to Songfacts, there were prominent fountains there. The band was formed by Schlesinger and Chris Collingwood. The band name was taken from the name of a lawn-ornament store in Wayne, New Jersey, not far from Montclair, New Jersey, the hometown of the band's bassist and cofounder Adam Schlesinger (it has since gone out of business). According to Songfacts, there were prominent fountains there. The band was formed by Schlesinger and Chris Collingwood. The two first met as freshmen at Williams College and began playing music together in various bands. The two eventually went their separate ways with Collingwood forming the Mercy Buckets in Boston and Schlesinger forming Ivy in New York City. The duo initially set out to work together in the early '90s under various band monikers (including Pinwheel and The Wallflowers), and recorded a full album's worth of demos in 1993. Although never released, the Pinwheel demos are widely bootlegged by fans and display a very different (and far more earnest) version of the pair's songwriting, though several songs from this period would be re-tooled and appear on later releases. After failing to get Pinwheel off the ground, the two met up once again during the mid '90s and formed Fountains of Wayne. A demo eventually landed the two a deal with Atlantic Records and in 1996 they released their self titled debut. The album spawned the singles Radiation Vibe and Sink to the Bottom which received airplay, but it was Schlesinger's song entitled That Thing You Do! which became a hit being used as the lead track for the Tom Hanks film of the same name. "That Thing You Do!" also brought Schlesinger an Oscar nomination and an RIAA gold certification for the hit soundtrack. Welcome Interstate Managers, Fountains of Wayne's third record and first for Virgin, was released in June of 2003. Preceeded by the single and video for the Cars-ish Stacy's Mom, the song became a surprise top 20 hit on the strength of its video--a send-up of 1980s teen comedies like "Fast Times at Ridgemont High"--which starred Rachel Hunter as Stacy's Mom. 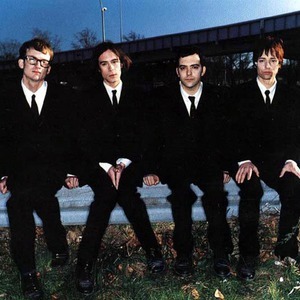 The video went into heavy rotation on MTV, pushing the album to become Fountains of Wayne's most successful with sales exceeding 400,000 units. In May 2011, the band has announced that their fifth album, Sky Full of Holes will be released on August 1st, 2011 on Lojinx in Europe, August 2nd, 2011 on YepRoc in North America and on Warner in Japan. Two singles have been released in advance of the album itself: Richie and Ruben in May 2011, followed by Someone's Gonna Break Your Heart the following month.